DIAL has expanded the current capacity of solar power generation at the IGI Airport from 2.14 MW to 7.84 MW thus making the airport largely dependent on green energy. Delhi International Airport (P) Limited (DIAL), a GMR led Consortium today announced that it has enhanced the solar power generating capacity at the Indira Gandhi International Airport (IGIA), New Delhi. 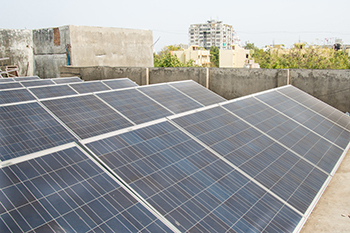 DIAL in 2014 had set up India’s first solar power plant at the IGI Airport that becomes the 1st airport in the world to be registered under Clean Development Mechanism of UNFCCC. Keeping in view the growing concerns about climate change, and rising need for green energy sources, DIAL has expanded the current capacity of solar power generation at the IGI Airport from 2.14 MW to 7.84 MW thus making the airport largely dependent on green energy. The power generated through the solar power plant at IGI Airport significantly supports the requirements of airport operations. “Aligning with the vision of Hon’ble Prime Minister Shri Narendra Modi to harness solar energy to fight climate change, we aim to increase our solar power generation capacity to 20 MW by 2020,” he added. The solar power project has been executed at the Airside of the IGI Airport after achieving all requisite safety clearances. The green field area of the Airside has been utilized without hindering and compromising the operations safety. The non-reflective PV solar panels are installed at the plant in a bid to reduce glare effect. DIAL has carried out computer aided Solar glare analysis for 365 days with complete sun movement from sun rise to sun set to ensure that there is no impact on flight movement. Solar Plant at the IGI Airport is one of the very few solar plants to harness land parcel at the airside, which is normally locked under various statutory rules and regulations. In December, 2015, the CEO of DIAL had represented the International Aviation community at the Lima to Paris Action Agenda (LPAA) Transport event of COP 21 at Paris. The LPPA is an initiative by Secretariat of the UNFCCC that brings individual and industries collective commitments to be instrumental in reducing greenhouse gas emissions. DIAL’s representation is a mark of DIAL’s efforts on environmental sustainability. Delhi Airport, which has been ranked as the best airport in its category by ASQ two years in a row, is the first Indian airport to implement Airport Collaborative Decision Making (A-CDM), which aims at improving Air Traffic Flow and Capacity Management and Emission Reduction. It is the first Airport in the world to be certified for ISO 50001:2011. This airport is also certified for Environment Management System (ISO 14001:2004) and Energy Management System (ISO 50001:2011). Delhi Airport has won numerous awards and recognitions including Green Company - Gold Rating Award and National Award for Excellence in Energy management – 2015 by CII--Green Business Center, Golden Peacock Environment Management Award and Golden Peacock Sustainability Award – 2015 by Institute of Directors for its exemplary performance towards environmental sustainability initiatives.